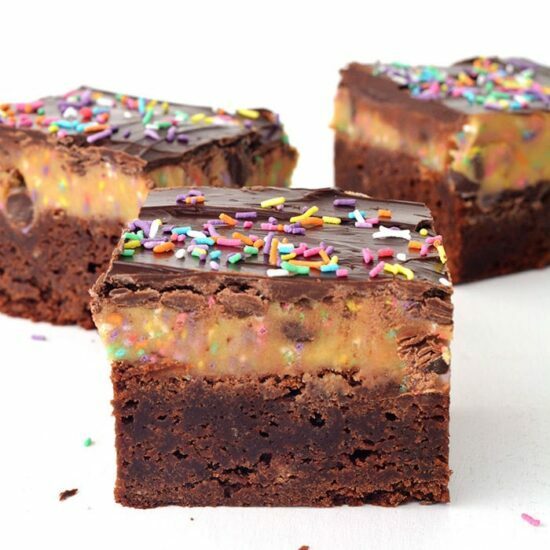 Fudgy chocolate brownies topped with chocolate chip funfetti cookie dough and a thick layer of chocolate – plus more sprinkles! Hellooo chocolate goodness! 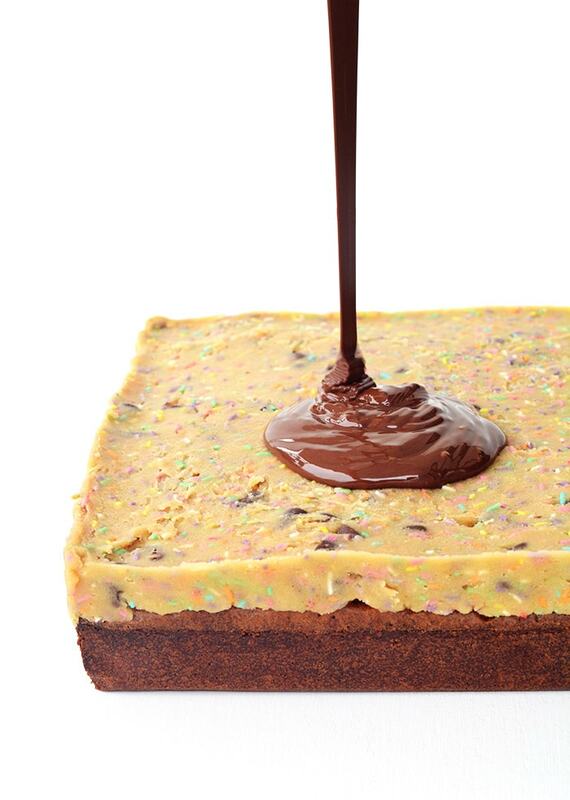 This is what you get when a fudgy chocolate brownie collides with chocolate chip funfetti cookie dough. A chewy, gooey chocolate treat that is sure to satisfy all your chocolate cravings! It is no secret that I love America and American sweets. That includes Ben and Jerry’s Ice Cream. Over here in Australia, a small pint of the stuff goes for around $13. Which means it is like gold and reserved only for special occasions. My absolute favourite flavour of Ben and Jerry’s is half baked. And that is how I learnt that chocolate brownies and chocolate chip cookie dough are a match made in heaven. These chocolate brownies are thick and soft, with a crinkly top, crispy, chewy edges and a melt-in-your-mouth centre. They are really good. But today we are not stopping there. Oh no. 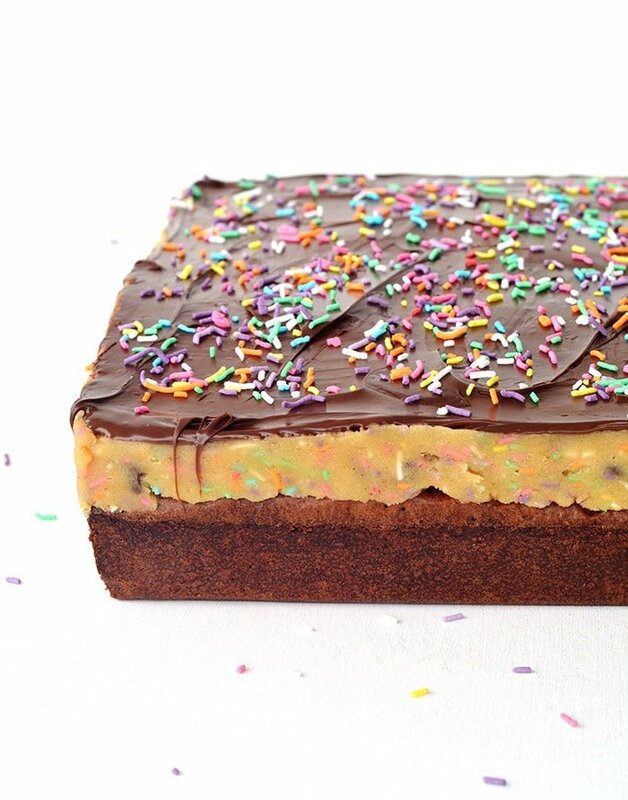 Next is an impressive layer of creamy chocolate chip cookie dough that is loaded with colourful sprinkles. This cookie dough is egg free so it is completely safe to eat! It should come with a warning though – it is seriously irresistible. And just because I’m a chocoholic, the final layer is simply silky smooth dark chocolate and more sprinkles (of course). I can’t EVEN. My favourite way to eat this brownie is served cold, when it is chewy, gooey and fudgy all at once. Grease and line a square 8 inch baking tin with parchment paper, ensuring two sides of the paper overhang. Put the butter and chocolate in a heatproof bowl and place on top of a medium saucepan that is filled with a small amount of water. You need to ensure the bottom of the bowl will not touch the water below. Place the saucepan on the stove on a medium heat and stir while the chocolate and butter melt. Once the mixture is lovely and smooth, remove the bowl from the heat and leave to cool slightly. Preheat the oven to 320 F (160 C). Next, add the sugar and vanilla to the chocolate mixture and beat with an electric mixer until combined. Add the eggs, one at a time and beat again. Sift in the flour and stir until the mixture is smooth. Pour the brownie batter into your prepared tin and place in the oven. 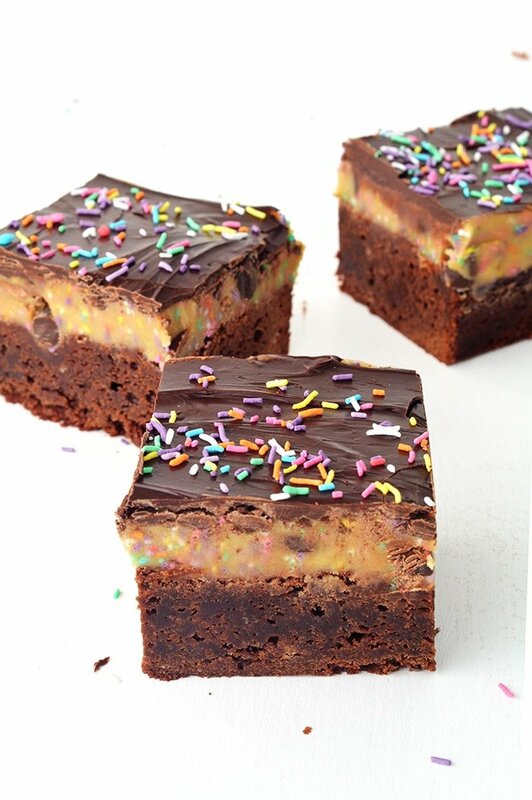 Bake the brownie for approximately 35-40 minutes. The brownie should have a nice cracked top and no longer wobble in the middle. Leave to cool completely. To make the cookie dough, add the softened butter and sugars to a large mixing bowl and beat with an electric mixer until pale and creamy. Add the vanilla and beat again. Sift in the flour and add the milk and stir until a soft cookie dough forms. Add in your chocolate chips and sprinkles and stir through. 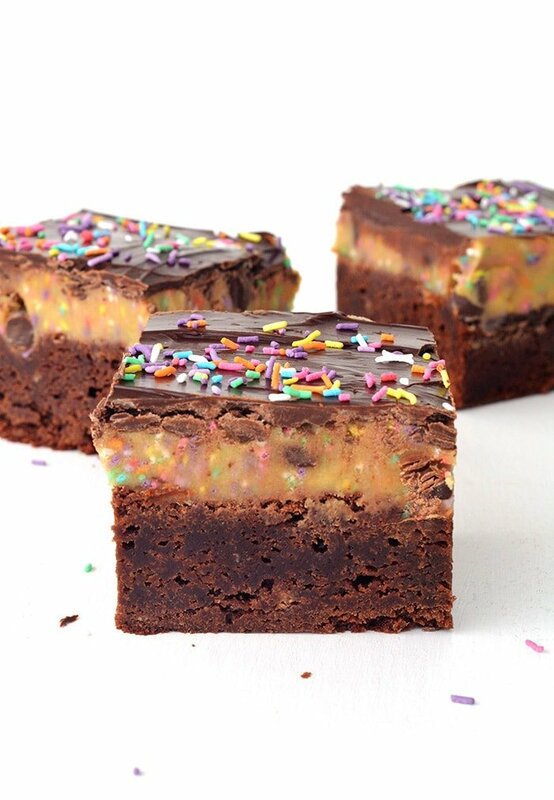 Then place the cookie dough on top of your brownie and spread it out as evenly as possible. Finally, melt your chocolate in the microwave, stirring in-between 20 second bursts, until just melted and pour oven the top. Add extra sprinkles. Pop into the fridge for 15 minutes to set, then cut and serve. Jess loves to create, bake and shoot American-inspired recipes from her Australian kitchen at sweetestmenu.com. With a background in advertising, she is a copywriter by day and a recipe creator/dessert taste-tester by night (and on the weekends). Even at her work desk, you will find her daydreaming about calorie-laden sweets and counting down the days to her next trip to the USA. All of the layers look so delicious!